Pumpkin Marshmallows are soft, pillowy marshmallows that taste like pumpkin pie! Pumpkin puree and lots of spices give these homemade marshmallows a great autumn flavor. If you have never made marshmallows before, check out the illustrated tutorial with step by step photos showing how to make marshmallows. You will need a stand mixer for this recipe. Note that marshmallows need to sit for at least 8-10 hours before cutting them, so it’s a good idea to make these a day before you plan to eat them. Check out my full list of pumpkin-flavored candies here. Prepare a 9x13 pan by lining it with aluminum foil and spraying the foil liberally with nonstick cooking spray. Mix the powdered sugar and cornstarch together in a small bowl, and sprinkle a generous dusting of this sugar/starch mixture over the entire pan. Set the pan aside while you prepare the marshmallow, and save the sugar/starch mixture for later use. Place 1/2 cup of cold water in the bowl of a large stand mixer fitted with the whisk attachment. Sprinkle the gelatin on top and stir briefly to distribute. Let the gelatin sit and dissolve for at least 5 minutes. Place the remaining 1/2 cup of water, the corn syrup, and the granulated sugar in a medium saucepan over medium-high heat. Stir to dissolve the sugar, and insert a candy thermometer. Allow the mixture to cook without stirring until it reaches 240 degrees on the thermometer. Brush down the sides occasionally with a wet pastry brush to avoid crystallization. Once the sugar syrup reaches the proper temperature, remove it from the heat immediately. Turn the mixer to low, and slowly pour the hot syrup into the mixer bowl. Be careful, as the syrup is extremely hot. If you have a large (at least 4 cup) liquid measuring cup with a spout, you can transfer the hot syrup to the cup before pouring to make it easier. Gradually increase the speed of the mixer until it is running on high. Whip the marshmallow mixture for 10 minutes, or until it is stiff and shiny. You can tell it is done when you stop the mixer and lift up the beater, the marshmallow will slowly drip back down into the bowl in a thick, shiny stream. While the marshmallow is mixing, place the pumpkin puree in a small bowl and add the cinnamon, ginger, nutmeg, and allspice. Once the marshmallow has reached the proper consistency, add the orange food coloring (or a combination of yellow and red to make orange) and mix until the marshmallow is a uniform color. Using a rubber spatula, gently fold the pumpkin puree into the orange marshmallow, stirring until the candy is well-mixed and there are no streaks of pumpkin visible. Pour the marshmallow into the prepared pan and smooth the top. Allow it to sit and firm up at room temperature for at least 8 hours. Carefully peel back the foil from the marshmallow. Dust the top of the marshmallow with more sugar/starch. 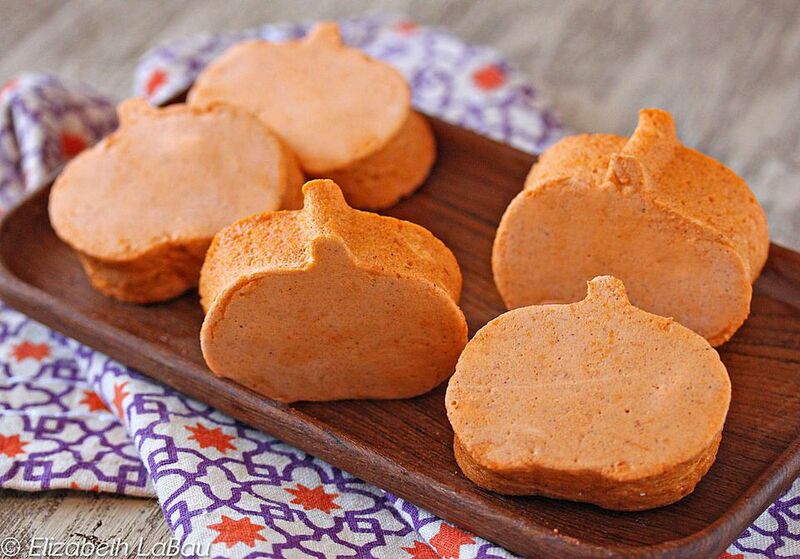 Dip a pumpkin-shaped cookie cutter into the sugar/starch mixture, and cut pumpkin shapes out of the marshmallows. Roll the cut edges of the marshmallows in the coating mixture so that all sides are smooth and not sticky. Alternately, you can use a knife and cut the marshmallows into squares instead. To save marshmallows, store them in a dry airtight container in a temperate, dry location. Do not refrigerate them or keep them in a very humid place. If they are stored longer than two or three days, you may need to re-roll them in the sugar/starch coating. Fresh marshmallows go stale after about a week, so these are best eaten soon after they are made. Click Here to View All Halloween Candy Recipes! Click Here to View All Pumpkin Candy Recipes!